Jawdat gave up an opportunity to work in theatre in order to pursue teaching, which he felt would be more suited to expressing his variety of skills and capabilities. He is an innovator with a vivid imagination who tries to strike out beyond traditional ideas. Jawdat energises his students by encouraging them to take part in a variety of performance groups and by organising events such as Dabka dances. Students are involved in these projects not just as performers but also as organisers, sound engineers, etc. The performances have been attended by more than twenty thousand people, and he and his students have won first place in several competitions. Jawdat has written and directed several motivational plays for students, together with launching projects to address environmental issues and teach values integral to personal success. During lessons he makes a point of varying his teaching methods and encourages students to stand up and move around every 10-15 minutes to stay active. He has integrated e-learning into his classes to expose his students to the world beyond Palestine, and for Year 12 history students he has developed electronic revision papers that consist of about 1,000 questions. 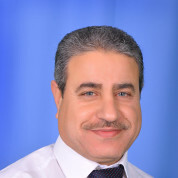 The pass rate of his students in Ministry exams has been 100%, and Jawdat himself has been receiving top marks in his annual administrative and supervisory reports since 2006. Join the #TeachersMatter movement by sharing Jawdat Sisan’s update.